The Spanish Society of Infectious Diseases and Clinical Microbiology (SEIMC), an ESCMID affiliated society, together with the Spanish Society of Hospital Pharmacy (SEFH) and the Spanish Society of Preventive Medicine, Public Health and Hygiene (SEMPSPH) organized the 1st Multidisciplinary Forum on Antimicrobial Resistance in the Spanish Parliament. Representatives of the organising societies and Members of Parliament discussed about the situation of antimicrobial resistance in Spain, and the actions to be undertaken, including the approval of Infectious Diseases as a recognized medical specialty and the need to keep the successful training programme for Clinical Microbiology in its present format. ESCMID contributed to the event with a talk by our President. These applications close on 14 November. The Global Antibiotic R&D Partnership (GARDP) has created REVIVE to connect and support the antimicrobial discovery, research, and development community. On 13 November, 17:00 – 18:30 CET (find your time zone here), GARDP will broadcast a webinar with Claire Sadler. After viewing Claire’s presentation “Making Safety a Part of Drug Design” from the GARDP/CARB-X co-organized “Antibiotic Bootcamp for Developers: Preclinical Toxicology” at the ESCMID/ASM Conference on Drug Development to Meet the Challenge of Antimicrobial Resistance 2018, you will have the chance to ask your questions in an interactive Q&A session. The draft version of the ESCMID-EUCIC clinical guidelines on decolonisation of multidrug-resistant Gram-negative bacteria carriers is now available for public consultation. This joint project came together through the concerted efforts of 15 experts in the field. Those of you wishing to comment on the manuscript may write to the ESCMID Publications and Medical Guidelines Manager to request the (confidential) draft of the manuscript along with the comments form for listing feedback. We are happy to receive your feedback and comments on the manuscript until 28 November 2018. Please be aware that your comments and the authors’ responses to the comments will be made available online once the guideline is published. "If you do not measure, you cannot improve it" (Lord Kelvin) is a paradigm that is especially true for Antimicrobial Stewardship Programs. International Guidelines consider it very important to make use of the large amount of data that we -willingly or unwillingly- collect in everyday practice. The main goal of this ESGAP/SWAB course is to provide participants with practical tools to measure, interpret and present data on the quantity and quality of antimicrobial use in their facilities. Experts in the field) will guide them through this process. 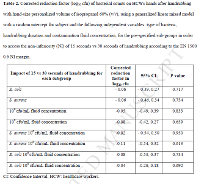 In a non-inferiority trial, Pires et al assessed Staphylococcus aureus and Escherichia coli contamination at different loads after 15 and 30 seconds of handrubbing with hand-size customized alcohol-based handrub (ABHR) volumes. The median corrected reduction factor (cRF) was 2.1 log10 (interquartile range [IQR] 1.50, 3.10). After fitting the model, cRF was significantly higher for S. aureus compared to E. coli but there was no significant effect for duration of handrubbing or contamination fluid concentration. Fifteen seconds of handrubbing was non-inferior to 30 (-0.06 log10, 95% confidence interval [CI] -0.34, 0.22; EN1500 0.60 log10 NI margin). This was confirmed in all pre-specified subgroups. The authors conclude that among experienced healthcare workers, using a hand-size customized volume of ABHR, handrubbing for 15 seconds was non-inferior to 30 seconds in reducing bacterial load. These findings were irrespective of the type of bacteria or contamination fluid concentration and provide further support for a shorter, 15-seconds, hand hygiene action.